Until 2013 the government operated a crisis support scheme called the Discretionary Social Fund. This provided support to people through Crisis Loans and Community Care Grants (as well as Budgeting loans). Community Care Grants supported vulnerable people to live independently, for example supporting people to establish themselves in their own home after a period of homelessness or a stay in residential care. Crisis Loans supported people facing a sudden financial crisis to cover the cost of household items and living expenses in the event of an unexpected incident such as a fire or flood. Responsibility for Community Care Grants and Crisis Loans was devolved to ‘top tier’ local authorities in England from April 2013 onwards in the form of new local welfare assistance schemes. Over the summer of 2018, Greater Manchester Poverty Action gathered data on local welfare assistance schemes in England. We were concerned that lack of central government funding and support for local schemes, at a time when local authorities are facing unprecedented cuts to their budgets, was undermining the ability of local councils to help residents in need of crisis support. 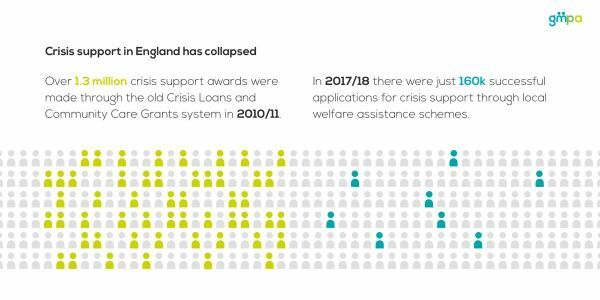 The findings of our research show there has been a collapse in crisis support in some parts of the country and that local authorities across England, including in Greater Manchester, are struggling to maintain well-funded, effective schemes. 22 local authorities don’t operate local welfare assistance schemes. GMPA estimates that this means 7.75 million people are living in areas where crisis support isn’t available. A further 29 schemes are under threat, with local authorities having cut the budget for their schemes by two-thirds over the last three years or operating schemes on budgets of less than £100,000 a year. The number of awards made through Community Care Grants and Crisis Loans was over 1.3 million in 2010/11 and over 700k in 2012/13 (the final year of the national scheme). This compares to a little over 161k successful applications for support through local welfare assistance schemes in 2017/18. This represents a fall in support of 88% between 2010/11 and 2017/18. 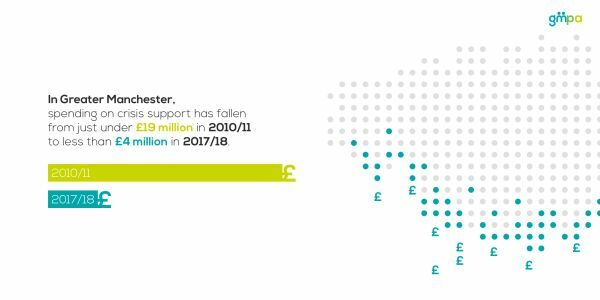 In Greater Manchester, spending on crisis support in 2017/18 was £3.8 million. This is over £15 million lower than spending under Crisis Loan and Community Care Grant provision in 2010/11. The number of successful applications for support through local schemes in Greater Manchester was 10,077 in 2017/18 compared to 123,220 Community Care Grants and Crisis Loan awards made in 2010/11. 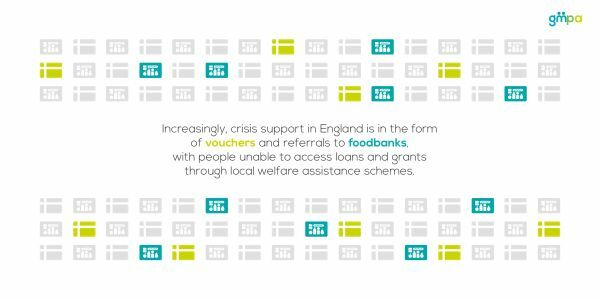 Increasingly support through local welfare assistance schemes in is the form of vouchers and referrals, not cash grants or loans. Around two-thirds of local authorities say they are not providing cash grants or loans through their scheme. In response to these findings GMPA is calling on central Government to end its hands-off approach to local welfare provision through the introduction of ring-fenced funding for local welfare assistance schemes, and we want to work with local authorities in Greater Manchester to improve provision. You can read more about the findings and our policy calls in the full report here and our fact sheet detailing the key points. 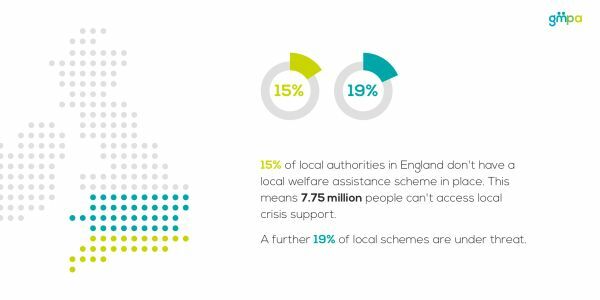 As part of GMPA’s research into crisis support in England, we tracked local authority budgets for local welfare assistance schemes across all top tier local authorities in England between 2015/16 and 2017/18. The research found that 22 local authority areas don’t have schemes in place, with a further 29 schemes being under threat (having cut their local welfare assistance scheme budget by more than two-thirds, operating schemes with budgets or less than £100,000 or using up historic payments from the Department for Work and Pensions). There have been significant cuts of between one and two-thirds in 16 local authority areas, with budgets falling by less than one-third in 25 areas. A total of 39 local authorities have either increased or kept stable funding for their local scheme. We have mapped these findings, with colour coding used to indicate how we have categorised different areas. Clicking on an area brings up further information about that area’s scheme. Information wasn’t obtained for 19 local authority areas.